Leaflet distributed at the Unite Against Fascism demonstration against British National party leader Nick Griffin's appearance on Question Time arguing against censorship and "ruling class anti-fascism". The recent row over the British National Party’s appearance on BBC Question Time displays the level of anger at the rise of the far-right party. All of us have turned out today because we oppose Nick Griffin’s racist effort to blame immigrants for all of society’s ills, including the economic crisis, and do not want his rubbish to gain more of an audience. But given the level of establishment racism, a campaign to defend immigrants must not stop at mere anti-BNPism, nor can the growth of the far-right be stopped by appealing to the existing authorities to silence them. The BNP’s electoral support has rocketed in recent years—in the last decade its European Election vote has increased ten-fold, achieving nearly one million votes in this June’s poll. Much greater in number than the fascist core leaders of the party, BNP voters are typically identified as working-class former Labour voters who no longer feel that they have a ‘voice’ with the open pro-business turn of that party. The BNP does not simply advocate its racist ideology, but also plays on very real concerns like poor housing, underfunded public services, and the economic crisis, to win support for their effort to scapegoat immigrants for these same problems. With all the main ruling class parties agreeing to the ‘austerity consensus’ that working-class people have to suffer because of the crisis, for some voters the BNP seem like an alternative. For this very reason it is mistaken to believe that the Labour and Conservative parties are allies in efforts to stop the growth of the BNP, as Unite Against Fascism does. UAF platforms often feature establishment politicians like Peter Hain, or even Sir Teddy Taylor, one of the most right-wing leaders of the Tories, because they are ‘anti-fascist’, and yet these are exactly the people at fault for the rise in the BNP vote. It is no good to accept the behaviour of the existing parties and keep silent about their racism and their capitalist ‘austerity and cuts’ consensus. This was shown when UAF’s Weyman Bennett, a member of the Socialist Workers Party, debated the BNP’s Simon Darby on the radio, steadfastly remaining ‘apolitical’ and saying nothing as Darby attacked bankers and free-market capitalism for causing the crisis—making it look as if the BNP were the only alternative on offer. This is a dead end both in terms of stopping people turning to the BNP, and stopping the media and political onslaught against immigrants. Moreover, although the Tory and Labour politicians who have alienated their voter base routinely denounce the despicable racist ideas of the BNP, they do so not because of sincere concern for immigrants, but rather for fear of a challenge to their support. They themselves rail against ‘illegal’ immigrants even more than against the far-right. And these politicians are not just speechifying: for some, this support for racist borders poses a very real life-and-death risk. 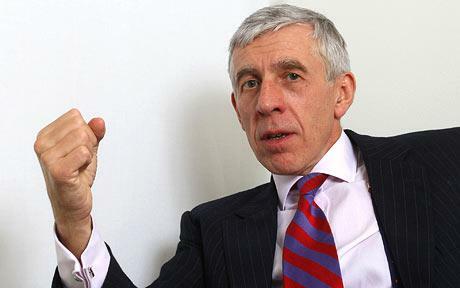 In 2000, when Jack Straw, who is opposing Griffin on Question Time tonight, was Home Secretary, 58 Chinese migrants died in a truck as they were smuggled into the UK: the direct result of ‘Fortress Britain’s’ borders. Day after day we hear of more police raids on workplaces—such as SOAS or the Willis insurance office in the City of London—where unregularised migrants had spoken out against low wages and long hours. The workers were arrested, imprisoned and then flown to their countries of origin, where they face poverty and violence from paramilitaries. Just last Friday the UK Borders Agency carried out its first mass forcible deportation to Baghdad since the 2003 invasion. Disgustingly, the Daily Express congratulated them, arguing that the Iraqis threatened to bring Sharia law and mass female circumcision to the streets of Britain. These sentiments are not just coming from the BNP—they reflect a racism running deep in British society. This conservatism of mainstream anti-fascism is also reflected in its tactics, with UAF lobbying the great and good of the BBC as well as the state to silence the BNP. They argue that the BNP is not a ‘legitimate’ party and the state should silence it: yet surely, in the state’s eyes, the radical left, the anti-war movement and militant workers’ struggles are also not ‘legitimate’? We must have no trust in state bans or state censorship: we need only look at its use of ‘anti-terrorism’ laws to silence protests, and its demands on migrants seeking regularisation to show their ‘loyalty’, with a ban on taking part in anti-war demos. The idea of ‘legitimate’ politics, as defined by the existing ruling class, is a total dead end. Yet that does not mean we want Nick Griffin on Question Time, and we look to a force which can challenge the BNP’s anti-immigrant propaganda: not the courts, not the Labour Party, but the collective action of organised workers. Much like the Sun workers who in 1984 blanked that papers’ lying front page during the Miners’ Strike, media workers should use their power to stop racist views getting an audience—from the BNP, or anyone else. Our support for free speech in terms of opposing state censorship by no means implies passivity to the BNP finding more and more of a platform. This debate does however pose the question of who changes society: the state intervening to curb the worst excesses of the worst parties, or collectively organised action by workers? Most centrally, we must challenge the underlying racism in society and insist that everyone has the right to live and work where they please and on equal terms. Only if we determinedly make the argument for this basic democratic right can we even begin to try and push back the atmosphere where Labour, Tories and the BNP trade blows over who can best sort out the ‘problem’ of immigration. Anti-racism and anti-BNPism should not be a propagandist effort separated from the existing struggles of unregularised migrants, which are usually in direct conflict with Labour. Here we can look to migrant-worker cleaners in the City of London and on the Tube as excellent examples of how to resist the recession. These workers, many of them without papers and living in a perilous unregularised status, have refused to accept management bullying and being paid peanuts. They show the whole working class that we do not have to knuckle under and accept the Labour-Tory consensus that the working class has to suffer because of the capitalist crisis: such community and workplace resistance is the real alternative, not the BNP. Borders, national identity and ‘legal’ and ‘illegal’ status have long been used by our rulers to divide the working class and bulldoze through their attacks. The answer is not to line up with Labour and the Tories, congratulating them on being less hostile to immigrants than the BNP are, but rather to build links between migrant workers’ struggles, resistance to the recession like the Royal Mail strikes, and anti-fascism resting on the power of organised workers rather than state censorship.